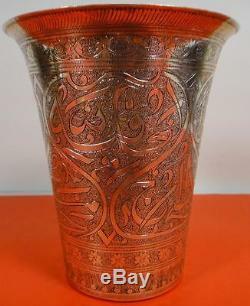 SULTAN ISLAMIC ARABIC STERLING SILVER GOBLET CUP OTTOMAN EMPIRE ART. I do not know how old this bowl is, but it shows good age. You can see Islamic text written on the side. I do not know what it says. It may have a words from Koran. With date or owner or maker. I do not know what kind of cup beaker it is. Maybe ceremonial or for drinking tea or water. I can not read it text on a side and bottom of this bowl. Inside has nice shine polishing. This old cup beaker is traditional Islamic design and made in Sterling Silver. Large Islamic Silver items are unique and very hard to find. Has visual makers mark on the bottom. Please see pictures for details. It is original, guaranteed for life. It is unique and hard to find. 115mm or 4 1/2 inches. Top Diameter 100mm or 4 inches. Diameter on the bottom: 60mm or 2 1/3 inches. Weight: 158.6 g or 5.59 ounces. Please see links for more info. Please see my other items. If you have more information please send it to me, and i can edit to my description. It came from a large estate collection please see my other auctions for similar listing. Nice adding to your collection. Box 4383 Greenville , DE 19807 , USA. Please leave your feedback , when you RECEIVE this item. See other items for sale. Large selection of Russian antiques and collectibles. WANT LISTS ARE WELCOME, We have been in business for over 20 years. We are experts at full service estate / personal property liquidations, Auctions and appraisals of whole or partial estates. We can represent you our clients in major world auctions such as Sotheby's , Christie's , Freeman , and others. We speak Ukrainian, Russian, and most Slavic languages. Rare and collectible coins, medals, badges, uniforms, swords, and daggers from all over the world. Political memorabilia of high officials. Awards and decorations from Russia and USSR. Russian Imperial antiques of any kind. Autographs, archives, and paper items from Russian Royalty origins. The item "SULTAN ISLAMIC ARAB STERLING SILVER GOBLET CUP KORAN TURKISH OTTOMAN EMPIRE ART" is in sale since Monday, July 19, 2010. This item is in the category "Antiques\Silver\Sterling Silver (. The seller is "ocha3" and is located in Wilmington, Delaware. This item can be shipped worldwide.